Is the killing of trees the link between this great rail disaster and 2014’s floods? Teetering above one of the busiest railway lines in England are 350,000 tonnes of soil and rubble. 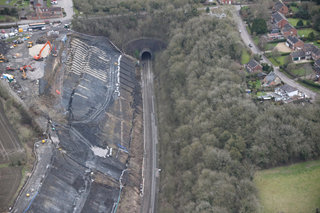 Three weeks ago, the landslip at Harbury in Warwickshire shut the main link between Manchester, Birmingham and the south(1), and the route between Birmingham and London Marylebone. It’s unlikely to reopen before Easter. An act of God? Perhaps. But before you decide, take a look at the images on Google Earth. The Harbury cutting is one of the deepest and steepest in the United Kingdom. The satellite photos show that in 2006 the slope was heavily forested. The next image, captured in 2010, reveals that the trees had been removed, and it had been scraped from top to bottom. In 2012, when the most recent image was taken, it remained bare and grey. Network Rail, which carried out this work in 2008, says it did so to protect the track(2). But grubbing out the trees, leaving the soil bare and scouring it vertically, without at least greatly lengthening the slope to reduce its angle, looks to me like a spectacular act of folly. These issues are complex. Trees on steep slopes often prevent landslides by binding the soil with their roots, anchoring it to the bedrock and reducing the amount of water it contains. But sometimes they can increase the risk by raising the load on unstable sediments. According to the UN’s Food and Agriculture Organisation(3), in temperate climates like ours there’s a high risk of landslides for about 15 years after trees have been removed. If you are going to take the drastic step of deforestation, you had better be damn sure that you’re making the right decision. And if you scrape or plough a steep slope vertically, you should also be sure that you are not accelerating soil erosion and slumping. Network Rail claims that removing the trees made sense, as they allowed water to seep into the soil(4). But either it doesn’t possess or it won’t send me any documents that might support this assessment. In either case, it’s fair to say that the works were not a resounding success. The landslip, which NR’s chief executive describes as “a massive incident”(5), occurred in the middle of the afternoon. Had it not stopped a few feet above the track, where it now hangs perilously, people might have died. If the works did cause the slip, they are consistent with the idiotic management of sloping ground across Britain and much of the world. Take, for example, the hillside above the A83 in western Scotland. One section of this road is closed by landslides every few months(6), costing hundreds of thousands to clear. The Scottish government is now spending millions of pounds on complex engineering to stabilise the slope. A report it published in 2012 acknowledges that sheep are likely to be partly responsible(7): they make the slope unstable, by compacting and eroding the soil and preventing trees and shrubs from growing. It notes that the number of sheep exceeds the danger point beyond which erosion becomes severe. But when I last saw the hillside two and a half years ago, after the report had been published and massive spending had begun, the sheep were still there. Every animal on that brae is likely to have cost taxpayers thousands of pounds a year. In India(8), China(9), Indonesia(10), Mexico(11), El Salvador(12), Haiti(13) and several other countries, deforestation has been linked to catastrophic mudslides over the past few years, some of which have killed hundreds of people. Last March, in Washington state in the US, a landslide wiped out the settlement of Steelhead Haven, crushing 43 people to death(14). In 1988, an expert report warned that if trees were harvested by timber companies on that slope, the increased flow of groundwater would reduce its stability for at least 16 years(15), until the forest grew back. For a while, logging there was banned. But the prohibition gradually slipped, and in 2005 a block of trees was cleared just above the top of the 2014 landslide(16). In Britain, we have learnt nothing from last year’s floods. The government is spending £2.3 billion on flood defence schemes(17), but most of them are at the end of the pipe: designed to protect houses and businesses after the water rushes down from the hills. Many, such as the £40 million conveyor intended to bypass parts of Oxford(18), are likely to shunt water faster towards the next urban pinchpoint, causing greater floods downstream. For a fraction of the money being spent on the Thames, the government could have reforested or protected all the high land that drains into its basin. As trees and other deep vegetation slow the flow of water from the hills, and as bare winter soils help to speed it into our living rooms(19), this policy could make all the expensive schemes redundant(20). But the issue hasn’t even been opened. When I asked the Environment Agency what measures it’s taking to stop floods at source, the only project it mentioned was Holnicote on Exmoor(21), which is, er, run by the National Trust. The two industries that do not routinely have to perform environmental impact assessments – farming and commercial fishing – are those with the greatest environmental impacts. You can see the results everywhere. For example, farmers mashing unstable slopes at the wrong time of year cause misery across England. A house in Suffolk was swamped 50 times in one winter by mud and slurry because a farmer put his pigs in a field above it(22). He needed to consult no one before taking this decision. You might have expected the conditions attached to farm subsidies to prevent such damage. But, perverse and irrational, in aggregate they probably do more harm than good. One of the few that’s routinely enforced is the “ineligible features” rule(23), banning farmers from receiving public money for land covered by scrub or other deep vegetation. So they clear these habitats, trashing wildlife and exacerbating floods downstream. We pay billions for farm subsidies, and billions for the floods they help to cause.